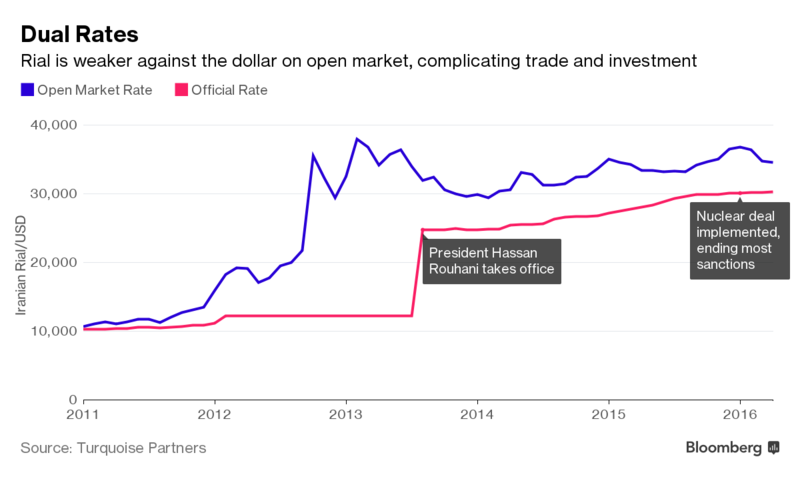 (Bloomberg) -- Iran’s rial tumbled to another historic low, resisting government efforts to shore up the economy as the restoration of U.S. sanctions looms. In an effort to signal they’re taking action to fight profiteering and cushion the blow of the U.S. economic offensive, authorities have rounded up more than two dozen merchants who they say exploited government currency measures for personal gain. Iran’s national currency, whose yearlong depreciation has gained momentum in recent weeks, set a new low this week against the dollar, trading on average at 112,000 rials on the black market on Monday, the Iranian Labour News Agency reported, from around 90,000 last week. The rial has also weakened against the euro. Many Iranians are fearful that their economy, already shaky from years of sanctions, mismanagement and corruption, will collapse following President Donald Trump’s decision in May to withdraw from the international nuclear deal with Iran and reimpose an embargo on Iran’s energy and financial sectors. Their expectation that life will only grow tougher has created growing discontent with Iran’s leaders that has boiled over into sporadic protests. Looking to minimize the impact of the sanctions, due to resume beginning on Aug. 6, authorities imposed restrictions on foreign-currency transactions and unified the official and unregulated exchange rates in an effort to shut down a flourishing black market that’s fed the slump in the rial’s value. But rather than choking off the illegal transactions, the introduction of a fixed rate allegedly has encouraged some traders to profiteer by charging higher black market prices for goods imported with dollars bought at the lower official rate of about 44,050 rials. The government last week appointed a new central bank governor to replace Valiollah Seif who had been criticized by President Hassan Rouhani’s political rivals for failing to avert the rial’s fall. Security forces dispersed black-market currency dealers from Tehran’s Manouchehri and Ferdowsi streets -- the epicenter of the illicit currency trade, according to ILNA. More traders were looking to buy dollars than sell them, signaling a stronger greenback in local markets, the report said. Iranian authorities investigating possible profiteering in car and mobile-phone imports have also stepped up their arrests. Judiciary spokesman Gholamhossein Mohseni-Ejei said 29 individuals have been detained for “disturbing” the nation’s economy and its “money and currency systems,” Mehr news agency reported late on Sunday. Others have been apprehended and may be arrested on Monday, he said. Court sessions will be held soon, he added, without giving details. Rouhani has promised to accelerate efforts to prosecute corruption within the state and private sectors to allay Iranians’ frustrations. Voters, who re-elected him last year, expected an improvement in their job prospects following the 2015 nuclear deal.